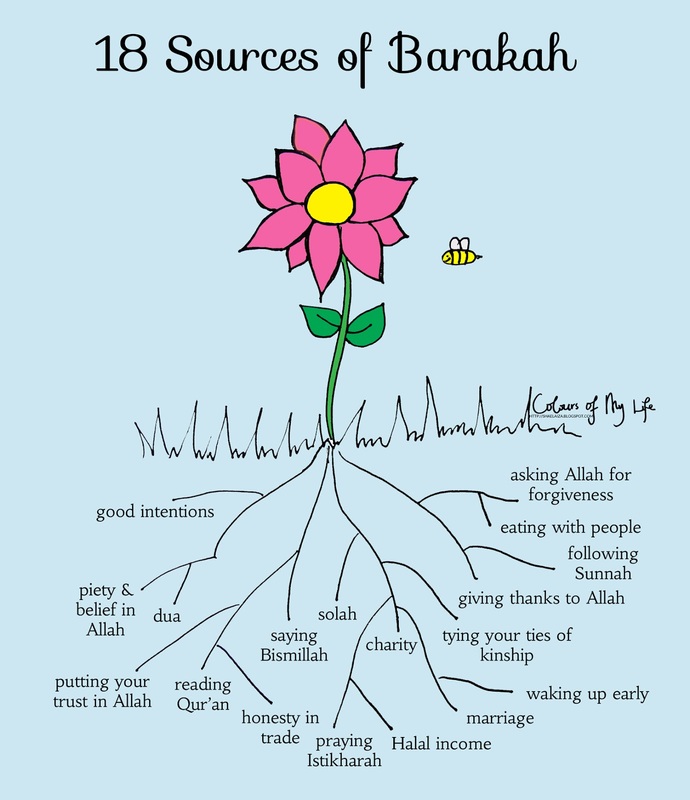 Today, I would like to share with you a visual of ’18 sources of Barakah’ compiled by Productive Muslim, and beautifully transformed into a visual by the inspirational Shahira Elaiza. I was thrilled to discover the Productive Muslim site as I loved their popular Productive Ramadan effort. Now, you may say I already know these things, what’s the point of repeating them. However, sometimes, the way a person explains a familiar concept, strikes a chord in you, and you feel like you are hearing about it for the first time. Or the speaker makes it easier to comprehend or motivates and encourages you to implement a good deed which you had forgotten about or left aside. When I was in uni, I had a hard time praying fajr. My reasons-(read excuses):late nights, cold weather and a very early fajr time; made me very lapse about fajr- I felt guilty, but obviously not enough to make a change. I then attended an Islamic lecture/talk, and among other topics, the speaker talked about problems people had getting for Fajr- I felt he was talking about me-all my excuses.Many people in the audience were nodding their heads-it seemed like I wasn’t the only with a ‘Fajr’ problem. Next, he asked the audience, how many of you have overslept for an exam, or are regularly late for work or class. (This lecture was organised by my uni’s ISOC, and let’s just say most of the students are super competitive, hard-working types ). Everyone who had been nodding previously wore a sheepish smile on their face, myself included. The speaker went on to explain that it was all a matter of mindset and priorities. We cared about the consequences of being late for an exam/class/work so we made sure we went to bed at certain set multiple alarms etc. We made it to exams on a few hours of sleep. So why did we regularly miss Fajr?..We didn’t care enough, it wasn’t a priority, we didn’t plan for it. Our attitude was if I wake up- I’ll pray..if not….God will forgive me!..on a daily basis. We make so much effort for this world when our stay here is temporary and finite, and yet so little effort for the next where our stay is permanent and eternal. I don’t know what it was but the comparision between being punctual for class vs waking for Fajr really struck me- and after that I made a REAL effort to pray and Alhamdolilah in time it worked. This is why whenever I come across some Islamic knowledge explained in a different way, I like to share maybe it will help some practise some part of our faith, or do a good deed. We all need these sweet reminders to aid us on the way tand keep us focused and on the ultimate goal:jannah. Please feel free to share the khair! Please also become a fan on Facebook so you don’t miss any posts. Thanks for reverting to this blog template.Now I can read and comment well. Jazak Allah Khair for the kind words about Productive Muslim website.